Damon Leverett: My name is Damon Leverett and I am a licensed Architect, Designer and Artist practicing for over 25 years. Originally from Detroit, I spent 8 years in Phoenix working primarily on mixed use development, institutional and healthcare projects. I also spent time in academia as a Visiting Lecturer in Design at the University of Illinois Urbana-Champagne and an Adjunct Lecturer at Lawrence Technological University. Currently, I am working at the American Institute of Architects in Washington, DC where our team of seven is managing a deep portfolio of resources and programs that support our emerging professional and diverse membership. Novedge: As Managing Director of Diversity and Emerging Professionals Engagement for AIA National you are in a unique position to see trends and challenges facing young architects today. What have you learned in your current role and what surprised you the most? Damon Leverett: I am not sure anything has struck me as overly surprising over the years but I am amazed now at how we are designing buildings in China from the US. What is surprising is the scale and volume of the projects, particularly in housing, that China is contemplating. It is designing ten blocks filled with buildings at a time rather than just designing one building at a time. Novedge: What are some of the most important things you would like students to take with them from architecture school to their professional life? Damon Leverett:I truly feel that Architecture education provides a well-rounded arts and science foundation which prepare students for licensure or a related field should the student choose a different path. When I work with my students I see them as more than just future architects but as future leaders. There are so many things we want students to focus on so it is difficult to single out an issue. Obviously this new generation of graduates will participate in an unprecedented global and data driven economy where significant concerns of sustainability, climate change and system efficiency will dominate their approach to practice. I hope that young architects will not only engage in lifelong learning related to the profession but also garner a deep understanding for economics, science and the digital domain so that they can be influencers in the changes that can affect the profession from the inside outward. Image by M00by under CC License. Novedge: What are your favorite blogs about Architecture that are still relatively unknown? Damon Leverett: It is hard to imagine that there would be an unknown blog. I do follow Randy Deutsch from the University of Illinois on his blog BIM and Integrated Design. However, whenever there is a hot topic in Architecture, I am quick to seek out Archinect to get a broad range of opinions related to our profession. Damon Leverett: I have recently sought to reflect on this topic in a series of lectures I have done on the history of drawing and drafting. In my career I have seen far reaching changes in the way we create design and construction documents. The way architects document their work, collaborate in teams and deliver projects to any region of the world represent the most significant changes I have seen in the past three decades. What will be different this time around is that change is happening at a faster rate. The “blueprint” has been around for more than 150 years, whereas the shift from hand drafting to two-dimensional CAD to three-dimensional BIM has only happened within the last 30 years. Web 2.0, three dimensional modeling and the cloud seem to be converging with new programs on the horizon such as Flux Metro. The next generation of design assist is poised to enter the scene soon. Novedge: How can architects interested in diversity in the profession become more involved? Damon Leverett: While the AIA is working on national programs and events through the Diversity and Inclusion Council, one way Architects can get involved in supporting diversity is through the pipeline to architecture in K-12 and other youth programs. The interaction with young people to share the architecture experience is best achieved at the local level where AIA chapters, schools, universities and community groups can work together. In 2014, I visited K-12 architecture experiences in Philadelphia, Washington DC, Detroit and Atlanta. AIA Atlanta has a fantastic program where local architects volunteer as instructors in after school architecture classes with 10-12 year-olds. Architects working with schools to provide positive perspective of our profession, particularly in urban cities will lead to a more diverse academic population and ultimately the profession as a whole. Some feel diversity and inclusion starts at age 20, when it really starts at age 10. Novedge: Can you tell us a bit about your upcoming projects at the AIA? Damon Leverett: The AIA Women Leadership in Architecture Summit is set for September 17-19, 2015 in Seattle. The event will gather architecture firm principals, educators, clients, designers, environmentalists, and innovators in an intimate setting to discuss the challenges and opportunities for women practicing architecture today. This is the third in a series of conferences scheduled bi-annually, focused on mentoring and leadership guidance. The AIA Diversity in Architecture Survey will launch on January 5, 2015. Building upon the last effort conducted in 2005, the survey will offer the AIA Diversity and Inclusion team critical intelligence about the state of the profession. The new survey has two main objectives. It will create a stable data set surrounding ethnicity and gender that will allow for periodic assessments and improved trend analysis. It will also examine the careers of diverse architects—from college to firm culture—to see how their experiences impact their professional choices. This year’s survey includes participation with the profession’s collaterals: ACSA, AIA, AIAS, NCARB, NAAB, NOMA, CCCAP and others. If you want to keep informed on the survey and the many other initiatives of the American Institute of Architects check out their website and follow them on Facebook. And don't forget to follow Novedge on Twitter for more news and discussions on Architecture. Daniel Bystedt: My name is Daniel Bystedt and I’m a 3d character artist. I work for a Swedish Animation and Creative Studio called Milford Film & Animation. Aside from my day job I’ve been doing tutorials for 3DWorld, 3D Creative, ZBrushWorkshops.com and beta testing for ZBrush/Pixologic. Novedge: Where do you find inspiration for your work? Daniel Bystedt: The internet is a fantastic place to gather material for both reference and inspiration. I usually check out zbrushcentral.com, artstation.com, cgfeedback.com for inspiration and Google image search and Pinterest for references. Even though the internet is great for getting some input, I find that it’s important not to get sucked into an endless loop of gathering inspiration and reference material. Creative work can be very competitive and to me it’s important to not compare yourself with the skill level of other artists, as it can be pretty destructive when trying to stay creative. Therefore I I think it’s good to try and focus on your own progress rather than comparing yourself with others. Daniel Bystedt: Usually I have a montage of images or ideas in my head that I’d like to push out as a 3d render, but I’d say that it’s only about 10% of those ideas that actually get completed in the end. After I choose one of those ideas I start gathering reference material or pull out some from the ever growing reference folder on my computer. The next step is to start concepting. Sometimes I do this as a 2d sketch and sometimes I just jump into 3d at once, depending on the complexity of the image that I want to create. At work I usually have a very strict type of workflow so I find it more explorative and creative to vary my choice of approach to each project when I’m doing personal artwork. I love to do character sculpts in ZBrush so I usually start with something really simple like a box/sphere or ZSpheres and sculpt away. One thing that I find really helpful during the sculpting stage is to take a screenshot of the 3d sculpt, bring it into a painting application like Krita (which is a free painting application) and do a paint over on top of the sculpt. Working in 2d has a great advantage over 3d, and that is speed. In my opinion there is no 3d artist who could compete with the speed of a talented 2d artist that just does a quick sketch/concept of a character or another subject. By designing in 2d I don’t have to invest as much time in different design choices and therefore can scrap a design if I feel it isn’t working for me. Throwing away things you’ve done in 3d is much more painful as you always invest more time in it. Changing the medium can greatly change the way the design turns out, so I really enjoy jumping between 2d and 3d all the time. Once I have my paintover I can use it as a roadmap of how to move further with sculpting in 3d. Daniel Bystedt: One project I had a lot of fun with recently was creating a trailer for a Swedish pen and paper role playing game called Mutant - Year Zero. Mutant: År Noll Release Trailer from Calle Granström on Vimeo. The collaboration of the production was very original compared to other projects I’ve worked on, since all the people involved were just a total of five artists without any producer or supervisor. We were all working in our free time after work, creating a post apocalyptic type of story, where my part was sculpting/modeling and texturing the main character plus doing some cloth simulation. It was a great learning experience which was also very creative. All the people involved worked in a flat hierarchy and therefore had a greater opportunity to make creative decisions for each part that they were working on. Mutant: År Noll Release Trailer VFX Breakdown from Calle Granström on Vimeo. Daniel Bystedt: My main go to 3D software is ZBrush. 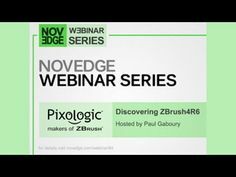 It’s the greatest tool I know for sculpting, and I love the innovative features that the team at Pixologic comes up with for every new release of the software. It’s also a great plus that they don’t charge for updates like other competitive software companies do. Lately I’ve been looking into Blender which is a free 3d application which has gone sort of under my radar in the past. It has some very impressive features, including a very competent renderer called Cycles. Rendering has always been something that I’ve felt stopping the “flow” of creativity, but with Cycles you can render in real time and change your materials in the node editor on the fly. It’s really great and if you haven’t tried it I strongly suggest that you do. Daniel Bystedt: Usually I’m given a subject by the client, such as using the panel loops feature in ZBrush or sculpting a quadruped. I think it’s a really good thing to be given some kind of constraint for the subject that I’m going to do a tutorial about as it narrows down my creative choices. A lot of the time the “empty canvas” can be a hard thing to get past in order to choose a subject and really start doing the actual work of creating a 3d character or environment. Novedge: What skills have you learned in life that are now serving you the best? Daniel Bystedt: I would say that having a routine is a great tool. By trying to do some type of creative work each day besides your day job, you really develop as an artist. It can be drawing, sculpting or exploring other aspects within the creative realm that you are interested in. The important thing is to just do something and spend a predefined amount of time on it. It doesn’t matter if the final results look bad. If you just put in the hours, in the end you will get better and better at what you do. Another important aspect is to finish things. It’s really easy to start with a project, grow tired of it and never complete it. It’s something that all creative people do, and a lot of the time I fall into that trap myself. However, if you never finish work you will not be able to let your portfolio grow. A good tool for being able to finalize work is to set a realistic scope for yourself. Maybe instead of that robot that blows up a city with fully simulated destruction, smoke, and a fantastic crowd animation of panicking citizens you should just focus on finalizing the robot? Daniel Bystedt: The ongoing battle of creating better art, growing as an artist and constantly learning new things is what’s next for me. The line of work I’m in is something I will never get tired of. It’s also very exciting to see the releases of new tools for CG artists that are constantly being developed. To see more of Daniel's work, check out his website and follow him on Twitter. And don't forget to get your own copy of ZBrush right here.